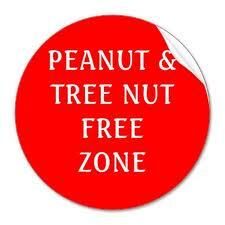 We have several children in the school who are very severely allergic to peanuts and tree nuts. In some cases this allergy is life threatening and just a trace of peanut oil can trigger a serious reaction. The school staff is prepared for such eventualities and parents of allergic students have taught their children not to accept food from other people. If there is a child who is seriously allergic in your child’s class, please do not send to school any peanuts or nut products. The teacher will let you know if there is a child who has such an allergy the class. Even if there are no children with allergies in your child’s class, please do not send nuts or peanut products to school. Please be aware that the following substances may cause a serious reaction: peanuts, cashews, pecans, almonds, walnuts, hazelnuts, pine nuts, pistachios, brazil nuts, macadamia nuts, chestnuts. Nut products such as peanut butter, nutella or almond essence in baking can also cause a reaction. The PAC has traditionally supported our sister school, Nightingale. 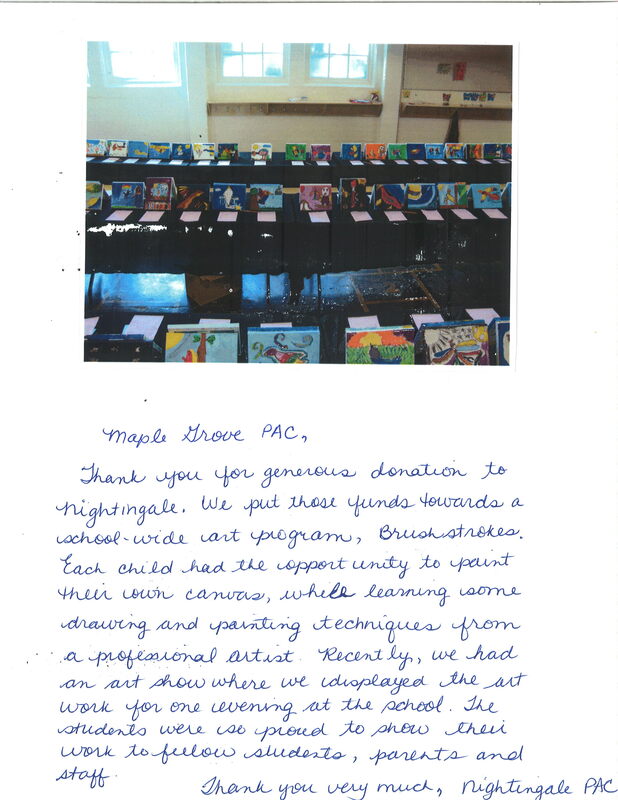 Last year the students at Nightingale were able to work with a professional artist as a result of our PAC sponsorship. They very much appreciated this support. Watch out for information about our new after school program, Glee Club. This is based on the very popular TV show called Glee and involves lots of singing and some movement. We have an excellent instructor and students will truly enjoy this exciting way to learn and enjoy music. Our instructor is Lindsay GARNETT. Lindsay Garnett is a singer and vocal coach from Vancouver, B.C. Her passion for music, precise ear for the human voice combined with extensive performance experience and years of study allows her to diagnose vocal issues with ease and aid students in finding their natural voices. In her years as a vocal coach she has had the opportunity to work with singers of all genres; from opera to hard rock, as well as speakers of all kinds; from news anchors to politicians. Lindsay studied RCM piano and voice, attended Trinity Western University and received a Bachelor of Arts degree with a Major in Voice. She believes firmly in continued learning / inspiration, and is always deepening her education. She participates in workshops and seminars internationally; studies Speech Sciences at UBC; and through private study, has learned the art of vocal pedagogy under the tutelage of Judith Rabinovitch. She also believes in maintaining the ability to perform, and so continues to work as a session singer. She has sung as a backup vocalist for such artists as Stabilo (Virgin Records), Jessica Lowndes (Universal Records), Cassandra Bangel and Crystal McGrath. She currently instructs private lessons and vocal ensembles, lectures vocal technique and classes in sight singing/ear training at PLBC; instructs Glee classes at Dance Co; and is go-to vocal coach for Saga Recording and Global News. She also runs a private vocal studio, VoiceBox, out of the Beaumont Studios in Vancouver. Watch out for more information about when this will start. The club will be open to Grade 3 and up. 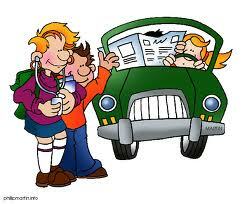 Do you drive your Maple Grove school student to and from home regularly? Would you like to share the driving? Ridesharing could be for you! Ridesharing involves taking turns driving; it helps the environment, saves on gas, saves parents’ time, helps build community and more. This is our focus for this month. Students in Divisions 16 and 2 made creative presentations at our first assembly to show the value of these virtues. Please help us at home by insisting on students saying please, thank you, excuse me, I’m sorry, you’re welcome etc. Students should also learn to hold the door for others, greet other people politely and with a friendly smile, exhibit good table manners such as not talking with a full mouth, sitting straight at the table and asking to be excused. Part of courtesy is learning to make good conversation at the table. Teach your child how to introduce, continue and conclude a topic of conversation when you all sit down for a meal together. Raising Children to be Independent and Good Citizens. This is a link to an interesting article in the New York Times. PAC meetings are good places to get involved, discuss issues and ask questions. Your input is valued. The first PAC meeting of the year will be on Monday, September 17th from 5:00 – 6:30 pm. Safe Arrival is a parent-run service that makes sure that all our kids get to school safely each day. After teachers take attendance, Safe Arrival parents follow-up on any unexplained absences (absences the teachers do not know about). Parent volunteers donate 2 days of their time each month, and work out of the main office from 9:00 – 9:45 on the days they are scheduled. Many hands make light work! The more volunteers we have, the more easily the coordinator can accommodate everyone’s schedules. If you have two hours a week to volunteer, please contact the Safe Arrival coordinator at monika@digitalquicksand.com. Please include a phone number and the days of the week that work best for you. Please click on these links for information about regular meetings for our Chinese parents: Chinese Tea poster and 各位家長. Our first Chinese Tea of the year was today. This is a very good time to meet people and also a time to discuss issues and ask questions. There is supervision on the playground in the morning from 8:40 am. Please do not drop your child off earlier than this. Supervision after school lasts until 3:20 pm. Please collect your children on time so that they are not distressed thinking that you have forgotten them.